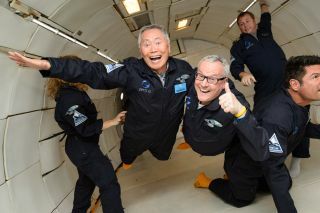 George Takei and his husband, Brad Altman, posed in zero-gravity aboard a Zero-G flight Aug. 17, 2016. George Takei has boldly gone where no "Star Trek" star has gone before: floating through the air on a zero-gravity flight. Takei, who played the original "Star Trek" crewmember Hikaru Sulu, joined "Star Trek" fans on Aug. 17 to celebrate the show's 50th anniversary. Lucky fans were able to meet and take pictures with Takei before climbing on board for a once-in-a-lifetime flight. Takei also flew with his husband, Brad Altman, and Rod Roddenberry, CEO of Roddenberry Entertainment and the son of "Star Trek" creator Gene Roddenberry. "The flight was an out-of-this-world adventure for everyone involved," Terese Brewster, president and COO of Zero Gravity (Zero-G), said in a statement. Zero-G provided the weightless flight in partnership with Rodenberry Adventures. To create the feeling of zero-gravity, Zero-G planes fly in a series of 15 parabolas. As the plane descends from an altitude of 32,000 feet to 24,000 feet (9.7 to 7.3 kilometers), passengers are lifted into the air for about 20 to 30 seconds of weightlessness. Takei was a pro, according to the statement. During each of the 15 weightless periods, he flipped effortlessly through the air and flashed the Vulcan salute with fans. He enjoyed it so much that he just might use one of the photos for this year's Christmas card.